Raglan was rescued from a hoarding situation where over 70 cats were living in deplorable conditions. Not only was it scary for this poor girl to live like that, she is also believed to be totally deaf, so not being able to hear what was going on around her had be so stressful. Raglan was rescued in 2014 and has been waiting a long time for her forever family. She is a very sweet, loving girl, but can sometimes be misunderstood. She loves being petted and loved on, but when another cat comes around, she will sometimes hiss or swat, which tends to turn some people off. If she had a person of her own, without the distraction of 100 other cats, she would be so much happier and loving. Once she trusts and bonds with someone, she is a big lap-cat. She was very close to our previous tech, and she would sit in her lap while being bounced up and down like a baby. It was the cutest thing! Raglan also enjoys all the activities at the shelter. She participates in Yoga and will sometimes inform people they aren’t doing their yoga moves right. During Reading to Cats, she is favorite participant because she will sit quietly on a blanket, while the kids read. She may not be able to hear their words, but she is getting individual attention, which makes her happy. She also loves music, which sounds odd because she can’t hear it. But she can feel it. We once a Sound Healing session at the shelter with Tibetan Singing Bowls and Raglan sat up the whole time, totally enthralled with the vibrations surrounding her. We loved how all the cats reacted to this session but seeing how Raglan reacted was fascinating. 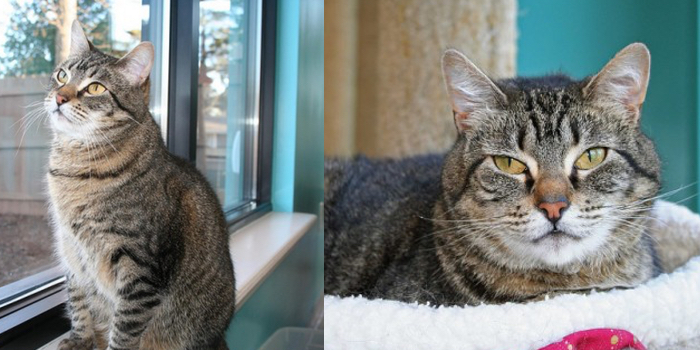 Raglan has been at Good Mews way too long and we really want to find this sweet girl a loving home of her own. She has never had a family and she really deserves it. She would do OK with another laid-back feline friendly cat and she would do great as a single cat. As long as she is pampered and treated like the princess she is, she will be happy.